Imagine a world without excuses. Stress would plummet. Regrets would vanish. Productivity would soar. Misunderstandings would disappear. Unproductive tangents wouldn't consume time or money. Our customized workshops reveal tested, easy-to-apply strategies that speed participants toward their goals. They cover what to do and how to do it. is a two-hour workshop designed for general audiences. 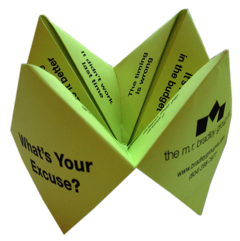 Participants gain insights into their own excuse style and the excuse tendencies of others. It covers practical tips for eliminating excuses. is a half-day workshop for leaders. Participants create excuse-prevention plans to help their teams meet unique challenges. Leaders receive individualized reports on their strengths so that they can leverage them to prevent excuses. is a full-day workshop for intact workgroups. During this workshop teams get rid of the causes of excuses. This session eliminates miscommunication, increases understanding of individual and team strengths, and streamlines the path to outstanding achievement. This interactive workshop provides a solid foundation for an excuse-free environment where excellence is the norm. Contact Dr. Margaret Bradley at mbradley@RapidResultsNoExcuses.com to discuss how a customized workshop can accelerate your team's success.